A Michael L. Printz Honor Award Winner A gentle, lyrical story of incomprehensible sorrow faced with quiet courage. ELIZABETH WEIN, "New York Times"bestselling author Hubbard treats tragedy and new beginnings with a skilled, delicate hand. JOHN COREY WHALEY, author of"Where Things Come Back," winner of the Michael L. Printz Award Senior Paul Wagoner walks into his school with a stolen gun, threatens his girlfriend, Emily Beam, and then takes his own life. Soon after, angry and guilt-ridden Emily is sent to a boarding school in Amherst, Massachusetts, where two quirky fellow students and the spirit of Emily Dickinson offer helping hands. But it is up to Emily Beam to heal her own damaged self, to find the good behind the bad, hope inside the despair, and springtime under the snow. A"Boston Globe"Best YA Novel of the Year A"KirkusReviews"Best Book of the Year A Tayshas High School Reading List SelectionA North Carolina Young Adult book Award Nominee * "As graceful as a feather drifting down, this lyrical story delivers a deep journey of healing on a tragic theme. "Kirkus Reviews," Starred *""And We Stay"is a little gem of a book. . . . there is certainly something for anyone looking for a good read with a strong, believable female lead who is working her hardest to overcome tragedy. "School Library Journal," Starred Hubbard s writing iselegantand emotional. "Publisher s Weekly" This novel is accomplished, polished, and mixes prose and poetry tostunning effect. "Booklist " Hubbard . . .captures perfectlythe turbulence of young love, the bonds of friendship, and the push-and-pull dynamic between teens and adults. 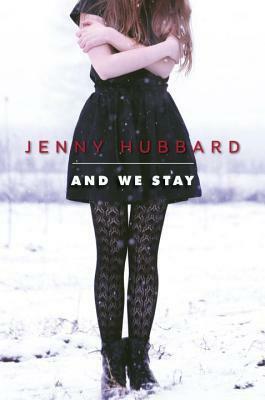 VOYA"
"In "And We Stay", Jenny Hubbard treats tragedy and new beginnings with a skilled, delicate hand. Her otherworldly verse and prose form a flowing monument to all the great storytellers of the past." --John Corey Whaley, author of the Michael L. Printz and William C. Morris award winner, Where Things Come BackStarred Review, Kirkus, November 15, 2013: "As graceful as a feather drifting down, this lyrical story delivers a deep journey of healing on a tragic theme. "Starred Review, Booklist, November 15, 2013: . "..Hubbard's narrative tone will only make readers want to lean in closer." Michael L. Printz Honor Award-winning"And We Stay"is Jenny Hubbard s second novel. Her first, "Paper Covers Rock," was a William C. Morris Debut Award Finalist. A former English teacher, Jenny writes books and plays in her hometown of Slisbury, North Carolina, where she lives with her husband, a high school math teacher, and their rescue dog, Oliver. You can find Jenny on Facebook, follow her (and Oliver) on Twitter at @HubbardWrites, and visit her website at jennyhubbard.com."